Research published this week provides insights on the most probable crash site for the missing Malaysia Airlines flight, as well as revealing new strategies for tracking movements of objects at sea. This research was published in the Journal of Operational Oceanography by a team of scientists from a number of European research centres, including the NOC, and was led by GEOMAR Helmholtz Centre of Ocean Research Kiel. The Malaysia Airlines Boeing 777 (MH370) has been missing for over five years and the extensive search operations have now stopped, although debris from the flight has been found washed-up along shorelines of the western Indian Ocean. The scientific team used the NEMO ocean model, together with an understanding of the drift effect of surface waves, to track where the debris may have originated. This allowed them to put the most likely crash-site region as west of Australia in the south-eastern Indian Ocean. “This study demonstrates the strength of the European partnership we have developed through our shared use of the NEMO ocean modelling framework” said Professor Adrian New from the NOC. 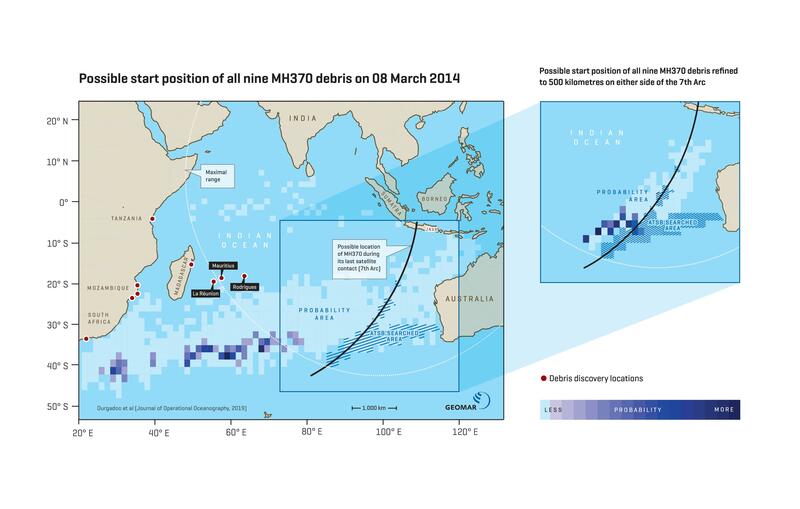 After disappearing from radar screens on 8 March 2014, the precise last position of the Malaysia Airlines flight is still unknown. Multiple large-scale search missions have failed. Shortly after the sighting of the first piece of debris, a flaperon on La Réunion in 2015, teams of scientists at both NOC and GEOMAR started modelling efforts aimed at simulating its likely drift. These groups were soon joined by others from Mercator Ocean in Toulouse and the Centre for Medium-Range Weather Forecasts (ECMWF) in Reading, to pool resources and undertake a more thorough and comprehensive study. The goal of this European modelling effort was to establish strategies for future quasi-real-time applications of the drift of objects or organisms in the ocean. In their quest, they addressed the importance of: including the drift from surface waves, using advanced simulation techniques and statistics, and whether more pieces of debris would refine their results. In addition to the drift from surface ocean currents and wind, an effect called ‘Stokes drift’ was found to be of central importance for the movement of objects in the uppermost layer of the ocean. This describes the net movement of floating objects caused by the passing of surface waves. “Ignoring Stokes drift in the simulations can lead to major errors, as we have demonstrated with the MH370 example. For any application where surface drift is studied, Stokes drift should be included to provide more precise tracking results”, explains Dr Jonathan Durgadoo of GEOMAR, lead investigator of the study. The research team assessed the differences in using the methods of forward- and backward-tracking in time. The path of an object can be tracked back in time or can be predicted. “The different tracking approaches provide a robust methodology and enable an assessment of uncertainties. These can be minimised by simulating sufficient numbers of floating objects”, continues Dr Durgadoo. The research team also extended their initial analysis, which was based solely on the flaperon found on La Réunion in 2015, to include other items of MH370 debris that were recovered in other locations. Despite considering these other wreckage parts, the crash area could not be refined without more knowledge of the buoyancy characteristics of the debris. Another limiting factor is the uncertainty in estimating the time difference between the debris washing-up on land and being discovered. “Unfortunately, no further information is available to us. Our current estimations suggest that, with at least five items of debris, an optimal area for the most probable crash-site region can be achieved”, emphasises Professor Dr Arne Biastoch, head of the research team at GEOMAR. However, there is very little hope for new information on the drift characteristics of the debris. Dr Durgadoo still draws a positive balance: “The exercise of estimating the surface drift of debris from MH370 has led to improved preparedness for future applications”. The results can also be applied to completely different surface drift simulations. For example, it is also possible to more accurately track and predict the spread of plastic waste or of passively drifting organisms, such as fish larvae or plankton. This research was led by GEOMAR, who worked in co-operation with the National Oceanography Centre (NOC), the Mercator Océan group in Toulouse and the European Centre for Medium-Range Weather Forecasts (ECMWF) in Reading.